I was seven years old, living in Warsaw, Poland, and Jewish when Hitler attacked Poland in 1939. The most important person in my life, at the time, was Kiki, my nanny, and Kiki was Catholic. Brought up by nuns, Kiki believed firmly that only Catholics were allowed into heaven and into the presence of God, and she loved me too much to see me deprived of that after-life reward. Consequently, with no objections from my mother, she proceeded to teach me to recite Catholic prayers, say the rosary, and tip my hat when passing a church. If I continued these practices and, some day, got baptized, I could eventually join her in paradise. Though it had not been Kiki’s intention, I also developed a strong distrust of things Jewish. Also in my life, though barely known to me at the time, was my mother, Barbara. Widowed by my father and remarried, my young and beautiful mother was the toast of Warsaw society and many other capitals and spas of Europe. Traveling a good deal of the time, sleeping late into the day when at home, and deeply involved in the social whirl, Mother was a glittering jewel at the periphery of my existence. Then, on the second day of WW II Kiki went home to her family in Lodz, my stepfather went into the army, and I suddenly found myself in the care of the virtual stranger who was my mother. Over the next years Mother would prove herself resourceful, creative, willful, and courageous. What she lacked was the slightest understanding of the management of little boys, particularly one who was in deep grief over the sudden loss of the only mother figure he had ever known. What ensued was an eighteen month odyssey of escape from under German bombers and strafing Messerschmitts, survival under Soviet occupation, a dramatic against-all-advice flight on foot over the snow covered Carpathian Mountains, and a trek through Europe and Brazil to the safety of America. And it seemed as though at each step of this journey Mother’s innate survival instincts and my “Christian morality,” as I understood it from Kiki’s teachings, clashed in deadly conflict. When we finally arrived in America and Mother told her version of our story, the newspapers hailed our escape a miracle. They didn’t know the half of it. 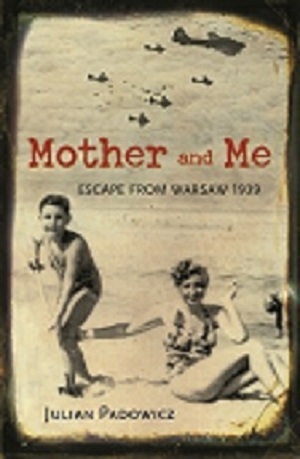 Mother and Me: Escape from Warsaw 1939 (Academy Chicago 2006, “Book of the Year” ForeWord Magazine) tells the story of our flight from under German bombs, life under Soviet occupation, and the escape into Hungary over the Carpathian Mountains. The vein of humor which I try to maintain through all my writing makes this a very different Holocaust survival story. 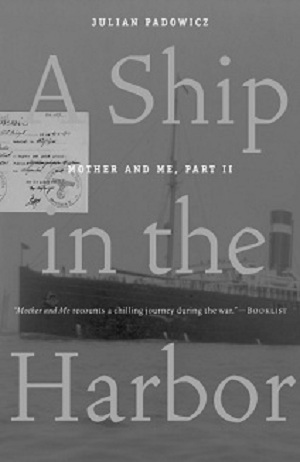 A Ship in the Harbor (Academy Chicago 2010) deals with the fact that Nazi-sympathizing Hungary did not prove to be the haven we had expected. While Mother’s Budapest friends lionized her as a heroine, we learned that Mother’s boast to write a tell-all book about German and Soviet atrocities, once we arrived in America, was not taken lightly by Hungarian authorities, and they were not about to let us reach America. Advised to go into hiding till passage to a more neutral country could be secured, Mother refused to surrender her new-found celebrity and I worried about her decision making abilities. A ship that didn’t exist plays a significant role in this story. 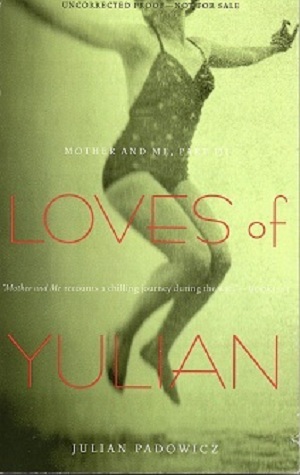 In Loves of Yulian (Academy Chicago 2011) I feel the first stirring of puberty on the beach of Rio de Janeiro, Brazil, and become infatuated with a beautiful older woman, twenty-three if she’s a day. Desperate for funds, Mother must raise cash as we wait for our turn on the “Polish quota” for admission into the United States. Mother has admirers and she must decide between remaining in Brazil as wife of the charming Ernesto whom she appears to genuinely love and continuing on to America where she plans to publish her book. I attend school and find myself totally inept in dealing with my peers, while my spiritual ambivalence becomes a tangle. Growing up American: A Prelude to Marilyn (not yet published) covers the thirteen years of my life between arrival in America and graduation from college. Emotionally unprepared for the testosterone of the all-boys boarding school Mother sends me to, while she proceeds to build a life for herself, I also find myself coping with a covey of developmental issues as I try to adjust to life in America. Dealing with raging hormones while I learn about dating, being morally correct towards “colored people,” becoming a “name” on campus, coping with my private “Jewish problem,” and expressing my creativity all become considerably more difficult as Mother tries to make me conform to her vision of a son. “I want you to be like your roommate, David, of whom your headmaster said, ‘You could put him in a library, and he will educate himself,’” Mother tells me during one visit to my prep school. When I’m in college, she calls to suggest that I teach all my fellow undergraduates (1300 of them) to sing a French song of which Mother knows only five words, so they can all sing it marching to classes in the morning. Somehow it all works out in the end as I achieve what was close to every college boy’s dream at the time. These books are reviewed on Amazon and may be purchased there or by clicking here Academy Chicago to reach the publisher directly. © 2012 Julian Padowicz - All rights reserved.